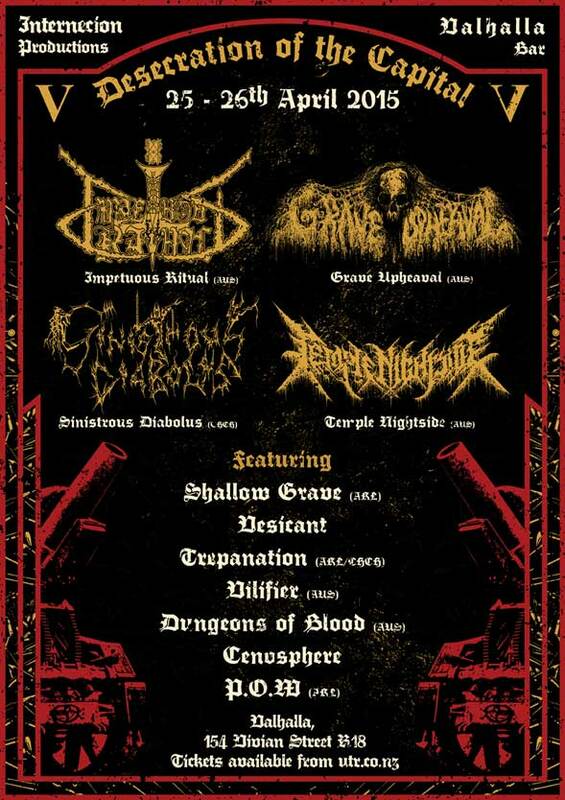 Exhumed once again for annual death worship, this edition sees the most extreme and destructive manifestation and will occur over two nights. Demented, horrifying and oppressive, IMPETUOUS RITUAL are one of the most destructive bands in Death Metal. A devastating act both live and on record contorting realms of unhinged violent obliteration with desolate threnodies of utter despair. Australia’s GRAVE UPHEAVAL are one of the most ominous, oppressive and suffocating Death Metal bands to exist. Both live and on record, they evoke an utterly claustrophobic atmosphere which can be likened to a torturous live burial. Aptly described as ‘Ritualistic Death Metal Necromancy”, TEMPLE NIGHTSIDE’s churning, sinister and hypnotic atmosphere is something few current bands are able to evoke. The brilliant “Condemnation” album, splits with Antediluvian and Vassafor as well as their performance at Black Conjuration which established them as one of the most ritualistic, heavy and mesmerising current bands in Black\Death. This marks their first appearance in New Zealand. One of NZ’s oldest and most cult Death Metal acts, SINISTROUS DIABOLUS return to consummate arcane rites of abyssal, funerary Death Doom. Monolithically bleak, SINISTROUS DIABOLUS will drag you within the howling void of oblivion. Dark, menacing and cavernous Death Metal out of Brisbane Australia played in the old way. Their sepulchral “Forlorn Graves” demo released in 2014 has distinguished them as promising new cult, this will be their first incursion on NZ soil. VILIFIER (AUS) – Blasphemous Death Metal creeping forth from ancient sepulchers. SHALLOW GRAVE (AKL) – Apocalyptic Doom Metal which beckons forth the coming Dark Age. TREPANATION (AKL/CHCH) – An unrelenting maelstrom of grinding War Metal.